Daughter of Franklin Graham and granddaughter of Billy Graham, Cissie Graham Lynch calls for unity in the nation. In 1952, Billy Graham stood on the steps of the U.S. Capitol building in Washington, D.C., and called on the United States Senate and Congress to request that the president enact a national day of prayer. This request was granted, annually calling people across the nation to be on their knees. Sixty-six years later much has changed, but not the need for the Lord. 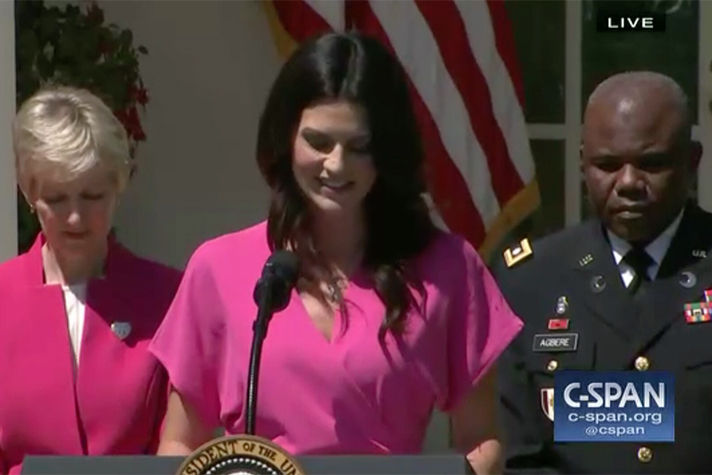 Holding true to her grandfather’s legacy, Cissie Graham Lynch prayed in the Rose Garden at the White House on Thursday. This marked the nation’s first National Day of Prayer without one of its greatest prayer warriors, Billy Graham. Even so, his legacy lives on as people continually turn to Christ. In the precious name of Jesus we pray—Amen. Cissie Graham Lynch is daughter of Franklin Graham and the granddaughter of Billy Graham. She was raised in the familiar surroundings of two ministries her father now leads—the Billy Graham Evangelistic Association and Samaritan’s Purse. Since 2010, Cissie has worked as part of the two organizations as a ministry spokesperson and special projects producer. She has traveled the world advocating for initiatives that reach women, children, and young adults. Her mission is to stand boldly for the Gospel in an ever-compromising world and encourage others to stand on only the Truth―the same Spirit-filled Truth that she has found in her relationship with Jesus Christ.